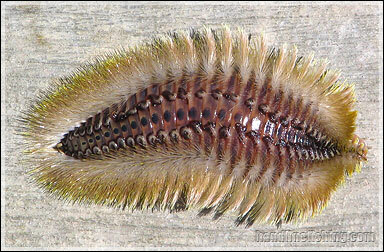 This worm is related to the fire worm with venmous bristles all over its sides of its body. Unlike the fireworm, this bristle worm is more predatory and swims around in the open water to hunt. They will eat pieces of leftover meat or even a whole live prawn. Their mouth can stretch pretty wide, allowing it to swallow the bait and hook within; which is why they can often be caught by angling. Removing the hook from the bristle worm should be done carefully as the bristles can break off on contact and can cause very painful sting. Use a pair of pliers, better yet two - one to grip on the worm, the other to remove the hook. This bristle worm is often considered a pest to anglers as it cause them to lose their bait and have a hard time dehooking it.